90 Minute Party- 1 hour of entertainment then your party food. 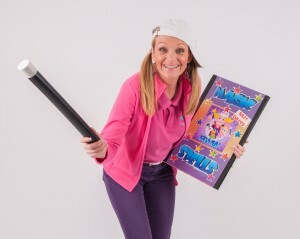 MAGIC FUN & GAMES SHOW OPTION– Traditional, fun and active party games, dance moves and magic to suit the age range. Party music, sparkly backdrop, Silly Gilly banners, professional sound system and disco lights. Lots of fun, laughter and audience participation. A special treat for the birthday child, they create and print, by magic, their very own birthday card, which even has their own photo on it. Special, large, fun, multi balloon character presented to the birthday child to make them feel really special plus a funny balloon hat. Optional PRIZES for helpers and winners so no need to rush around the shops. Optional add-ons…to make the entertainment last that little bit longer! Face painting (before the magic fun and games show as the children arrive at the party). Balloon modelling (after the Magic, Fun & Games Show). Having the food after the entertainment allows the slower eaters more time to relax and enjoy their party food while the entertainer packs away. Joint birthday parties can be catered for by adding only £30 for each additional birthday boy or girl so they don’t miss out on their special balloon!